Submitted by webmaster on Sun, 14/07/2013 - 01:42. 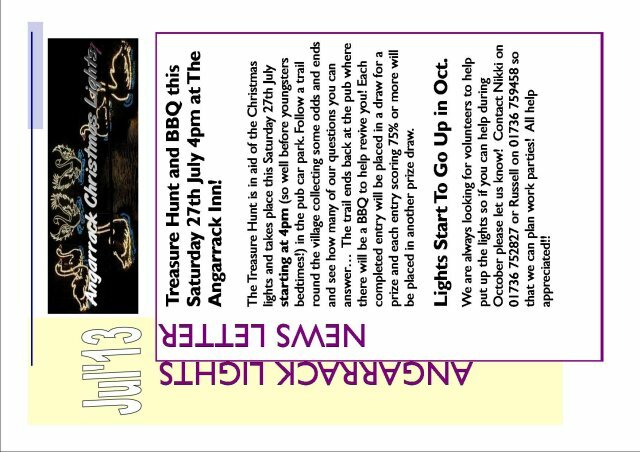 Treasure Hunt and BBQ this Saturday 27th July 4pm at The Angarrack Inn! The Treasure Hunt is in aid of the Christmas lights and takes place this Saturday 27th July starting at 4pm (so well before youngsters bedtimes!) in the pub car park. Follow a trail round the village collecting some odds and ends and see how many of our questions you can answer… The trail ends back at the pub where there will be a BBQ to help revive you! Each completed entry will be placed in a draw for a prize and each entry scoring 75% or more will be placed in another prize draw. Lights Start To Go Up in Oct. We are always looking for volunteers to help put up the lights so if you can help during October please let us know! Contact Nikki on 01736 752827 or Russell on 01736 759458 so that we can plan work parties! All help appreciated! !